Studies show that nearly 50% of North American businesses will incorporate tablets and other new mobile platforms (iPhones, Android, Windows 8) into their corporate networks this year. Are you ready for the challenge this new technology presents for system support, management, and security? 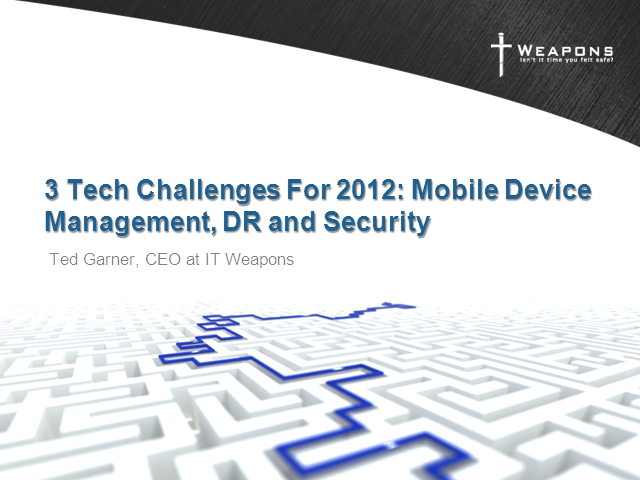 Join IT Weapons CEO, Ted Garner, for a candid look at the trends that are impacting today's IT leaders and the innovative strategies and tools available to help you meet those challenges head-on. In this exciting and interactive webcast we'll explore the intersecting issues around Security and Compliance, Mobile Device Management, and Disaster Recovery planning. We’ll share the insight you need to keep your business agile and resilient. Employees must have access to desktops, apps, files and collaboration just like they would in the office and IT Security must control and secure business information. 3) Reduce travel, labor, and real estate costs through flew-work, telework, and alternative workplace strategies. 4) Attract and retain the best experienced people wherever you fine them! Bill Scarborough, Mgr of East & Federal Pre-Sales at AppSense and Jeremy MacBean, Dir. of Business Development at IT Weapons. Virtualization is a top priority to reduce costs and improve business efficiency for most of the world’s leading strategic IT teams. Citrix XenApp provides a delivery infrastructure that makes it easy to deliver any application to any user with high performance and security at low cost. AppSense helps you get more out of your existing Citrix XenApp infrastructure by providing additional levels of policy and personalization management, together with managing application access and system resource allocation - all in one solution. Register today to hear best practices and real-life success stories to extend the value of your application virtualization investments. Today's IT environments have become a security management nightmare. With the growing complexity of products, and common misconceptions of misguided marketing campaigns and misunderstandings of deployed technologies, organizations are faced with significant challenges to managing their security environments. Did you know that most security breaches today are fundamentally caused by relying on technologies to solve problems they weren’t designed to solve? The nature of the majority of attacks are opportunistic so improperly deployed access controls end up leaving organizations with a false sense of security and are vulnerable to attacks. Ted Garner, CEO at IT Weapons and Jeremy MacBean, Business Development Director at IT Weapons. Does it make sense to move some of your applications and data to a cloud or data centre provider? How important are DR considerations to your lines of business? Most importantly, what should you look for in a managed services, cloud, or data centre provider? Today’s IT marketplace is flooded with choices; from break-fix IT support and traditional managed services to tomorrow’s Infrastructure-as-a-Service. Join IT Weapons for a no-nonsense look at today’s Data Centre and Cloud marketplace. In this webcast we’ll give you the straight talk on what to consider when you think about Canadian private cloud and data centre services for your business. For this webcast, we’re taking an inside look at the latest networking, application access, and security features baked into the 2012 Citrix NetScaler 10 technology. Join IT Weapons and Senior Citrix Sales Engineer, David Cooper, for this technical tour of the industry’s most advanced cloud network platform; Citrix NetScaler. Citrix NetScaler 10 enables the data centre network to become an end-to-end service delivery fabric to optimize the delivery of all web applications, cloud-based services, virtual desktops, enterprise business apps and mobile services. It ensures the performance, availability and security SLAs for any service to any user, anywhere. Chris Horne, Principal Virtualization Consultant at IT Weapons and David Styczynski, Channel Systems Engineer at VMware. Do you worry about the business impact of data loss if disaster strikes? Does your DR plan depend on complicated, error-prone run books and manual processes? Do you refrain from testing your DR plan because it's expensive and difficult? If you've answered yes to these questions, then you're not prepared, and your business may be at risk. True business resilience requires investment, and monetary cost is only a portion of this investment. Developing the right disaster recovery strategy for your organization takes time and planning. Join IT Weapons and VMware for this webcast to see strategies and solutions that will improve the disaster recovery preparedness for your business. Odds are you've already virtualized much of your server and storage infrastructure. Now you are wondering how to leverage the Cloud and realize its true benefits. All the choices available can leave you confused. When it comes to the Cloud, the direction you choose for your business can impact performance, availability, backup and disaster recovery. Join us for another exciting webcast where we'll explore the Cloud landscape and help you see the real differences between Public, Private, and Hybrid models. You'll leave this session understanding the tools and services available to turn today's virtual servers and storage into tomorrow's high-performance Cloud infrastructure. Even with the most comprehensive security appliances at work, your people can still create security holes. The actions a user takes during their day-to-day work can leave your company exposed to security breaches and allow unauthorized entry into the corporate infrastructure. Well meaning and loyal employees can inadvertently create vulnerabilities in your environment. This webcast will highlight some employee behaviours and actions that can potentially compromise your corporate assets. We will also discuss some key ways you can better protect your organization and educate your users. Live monthly webcasts for technology professionals. Our monthly webcasts showcase an array of technology topics to keep your business feeling safe. Our goal is to deliver quick updates on what's new with IT Weapons and the IT industry at the convenience of your own schedule.